I’ve written before about my interest in BITE Beauty (and my visit to its “lab” in NYC! ), but I don’t think I’ve done a straightforward review of any BITE products. Here’s one for a lipstick that I’ve been wearing often over the past month: BITE’s Luminous Creme Lipstick in Zin. Zin is described as a “muted berry,” which is just about right. It’s not as deep and wine-y as the product shot on the Sephora site make it look: it really is a cool-toned berry, but not too cool—I can’t wear anything that falls too far either way from neutral, so Zin is just about right for me. BITE’s Luminous Creme formula is also just right: creamy, but not glossy. It doesn’t have any shimmer or sparkle, yet it never looks flat. Here’s a swatch of Zin on skin. 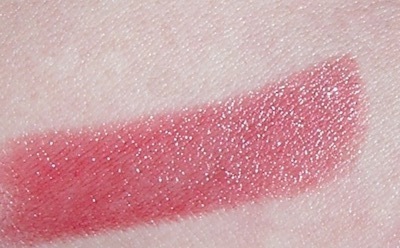 As you can see, this lipstick has medium pigmentation; it’s not a sheer formula, but not an opaque dose of color, either. I’m finding that one coat is enough, but if I wanted to go a little stronger for evening, I get full coverage with another swipe or two. This color has become one of my go-to shades for work days; it complements most of my clothing, as well as my skintone. The Luminous Creme formula holds up well for everyday use. It lasts through a cup of coffee, but I need to reapply after lunch. It has a faint lemon-y scent that fades away quickly. One possible complaint: the “bullet” of lipstick never seems 100% secure in its base; I try to apply gently, but I still find that the actual lipstick ends up tilting back slightly and getting scraped on the inside of the tube. And one quibble: I know that everyone likes to mention BITE’s use of the anti-aging ingredient reservatrol, but that’s the least interesting aspect of this product, for me. I’m only wearing this product directly on my lips, not on the skin around my mouth (or around my eyes, on my forehead, etc., so what kind of aging is it preventing? Otherwise, I’m very happy with Zin and I would repurchase it. Have you tried any BITE lipsticks? What did you think? BITE Beauty Luminous Creme Lipstick sells for $24 at Sephora, which is where I purchased mine. Images: top photo from the Sephora website, other photos by Tinsel Creation.